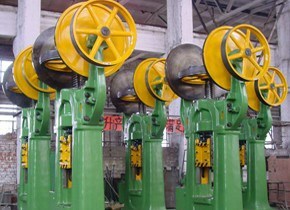 Double-disk friction screw press is a screw press which makes use of the contract transmission of the flywheel and the friction disk and works relying on the relative movement of the screw and the nut. Double-disk friction screw press is an all-powerful press processing machine and has wide application in all kinds of press processing industries. It has wider application in machinery manufacturing industry as it can complete die forging, upsetting, bending, revising and pressure-sizing. As it is all powerful and has the features of simple structure, installation, operation and auxiliary equipment and low price, it is widely used in press room, forging shop and die forging room in machinery manufacture, automobile, tractor and aviation industry. In addition, it is also a type of building material machine which is widely used for the dry pressing production of tile, earthenware pipe and refractory products.